Today we had a visit from a dear industry friend, Lee Odess. Lee has been in the lighting control & AV business for many many years and has now gone out on his own. 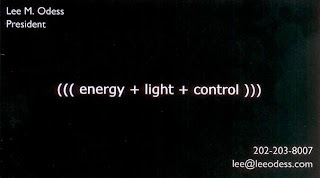 Check out his new business at www.leeodess.com ~ we will be partnering with him for lighting control projects, and I hope we also learn a thing or two about solar & wind control as we go along! I'll be on vacation starting this Friday until Monday the 17th, so this will probably be my last post till I get back. Have a great couple of weeks!